Cultural osmosis is a strange thing. I've never laid eyes on an American football player in full uniform, never watched a cheerleading demonstration and certainly never been yelled at by a grumpy yet also compellingly paternal coach. And yet I've experienced all this countless times in film, television, literature and now on stage. I know this iconography like the back of my hand and yet it's like something I've only dreamt about. Hoke's Bluff is the theatrical realisation of that dream. Every item of clothing, turn of phrase and social interaction relevant to high school sports has been fed into a kind of dramatic blender. The company, Action Hero, hit frappe, and what oozes out is a kaleidoscope of ritualistic behaviours and intensely codified behaviours. Given that high school sports is one of the purest manifestations of WASPish conformity it's faintly ironic that such an outright weird piece of theatre has been made out of it, let alone seeing it through a alien prism of Britishness. The barebones plot revolves around the Hoke's Bluff Wildcats; a high school sports team in Everytown, USA. The precise sport they're playing is slippery to pin down; one moment they're talking about quarterbacks and the next they're laying down on the ice. Central to the plot is Tyler Purdem (James Stenhouse), star of the sports team and his cheerleader girlfriend Connie (Gemma Paintin). Both are experiencing their own psychological turmoil. 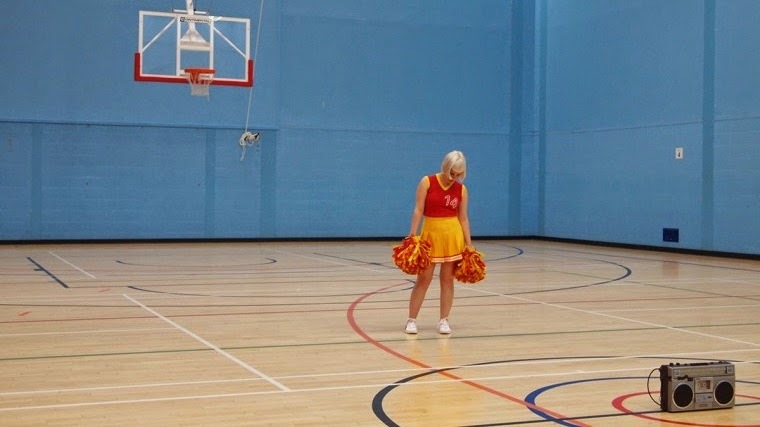 Tyler is under intense pressure to win this year, yet is finding it difficult to "release the ball" and Connie feels sidelined in her boyfriend's affections and objectified by cheerleading. 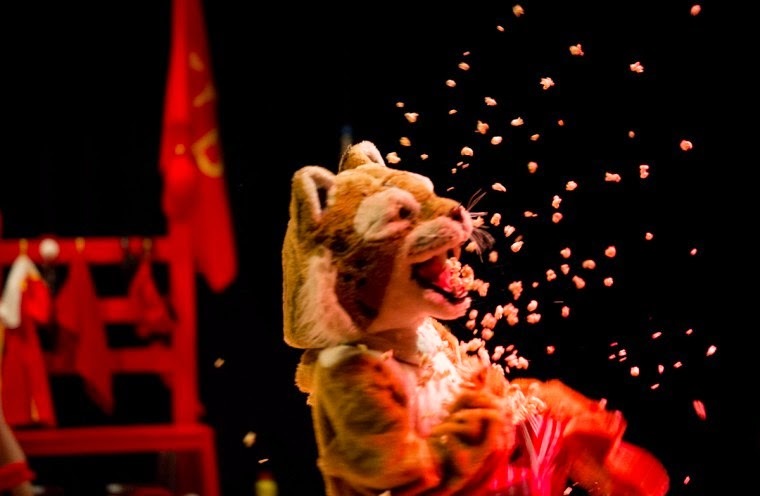 The two performers bring to life an extensive cast of characters; the entire cheerleading squad, the players on the team, the energetic mascot and the grizzled, motivationally addicted coach. The only other person on stage is the Referee, played as a quixotic Greek chorus that communicates only in semaphore and garbled sportspeak. Both Paintin and Stenhouse stay in constant, slightly sweaty, motion - always limbering up or running laps around the performance space (which is styled like a US high school gym). Easing into the warped world of Hoke's Bluff is a gradual process. As the play starts you assume that this is going to a relatively straight performance of American rituals. But then you begin to notice the cracks; none of the terminology really makes sense, the markings on the floor appear to spell out some kind of magical sigil and that everything is translated into some hyperreal distillation of reality. There are constant digressions to strange poetic repetition. Cheerleaders listing acrobatic moves or coaches laying out sports plays (my favourite being "The Immaculate Reception"). This is taken to a whole other level in the long, plaintive, slightly creepy, listing of names of places "Did you ever get blind drunk in Newtown? Did you ever speak to a bereaved father in Barrel Gorge" and so on. This shift into repetition is disorientating and, again, reminiscent of the cut-up half-thoughts that swim through a tired mind on the verge of dreaming. These gentle drifts into the bizarre were some of my favourite moments in the play, closely followed swiftly by the intoxicating dance scene set to Major Lazer's Get Free. It's in these stylistic flights of fancy that Hoke's Bluff comes close to nailing down the ambient sea of hormones, ambitions and fears that permeate this very alien world. Dissecting small town Americana and presenting the mangled remains reminds me a bit of Twin Peaks; taking the melodramata and folksy, small town big heartedness as sincerely as possible without descending into mockery. Not everyone is going to enjoy a show this fragmented. The narrative is more suggested than shown and the characters are (intentionally) bland archetypes we've seen a thousand times before. This means that if you want to get anything worthwhile out of Hoke's Bluff you're going to have to engage emotionally and analytically with the images, language and aesthetics on stage. Fortunately I love that stuff, so I had a great time. This is maybe a bit too weird for mass consumption, but for me it was compelling, unique stuff. Hoke's Bluff is at Shoreditch Town Hall until the 29th of November. Tickets £11, available here.